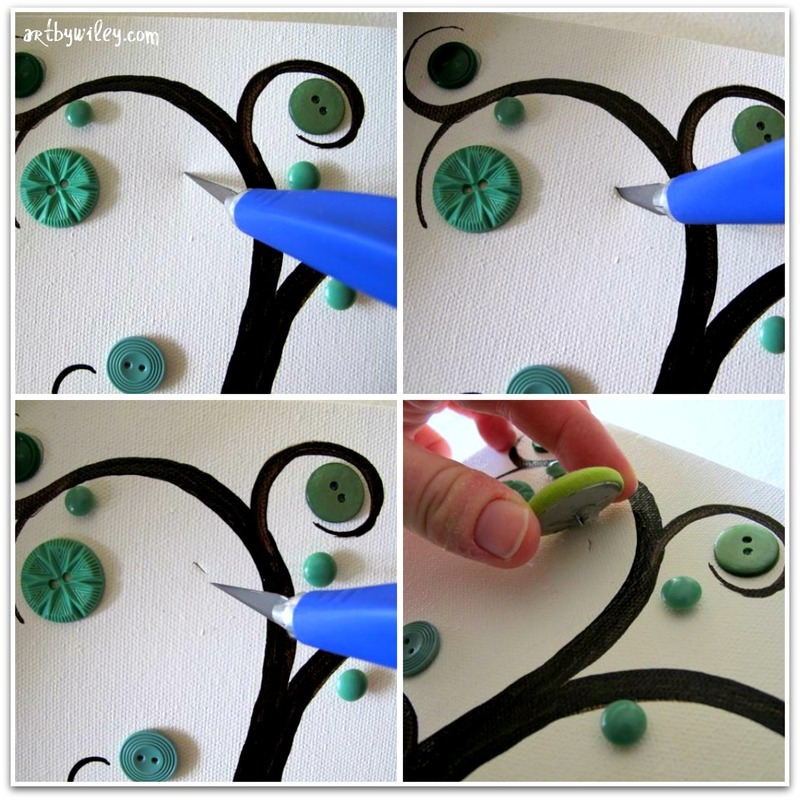 Earlier this week I told the story of how we started making button trees, how we started selling them and even how we made it into some newspapers with them. It was a wild button ride! When we stopped making them to pursue other creative endeavors we had no idea they'd develop a life of their own on Pinterest and bring people to this blog every day to check them out. 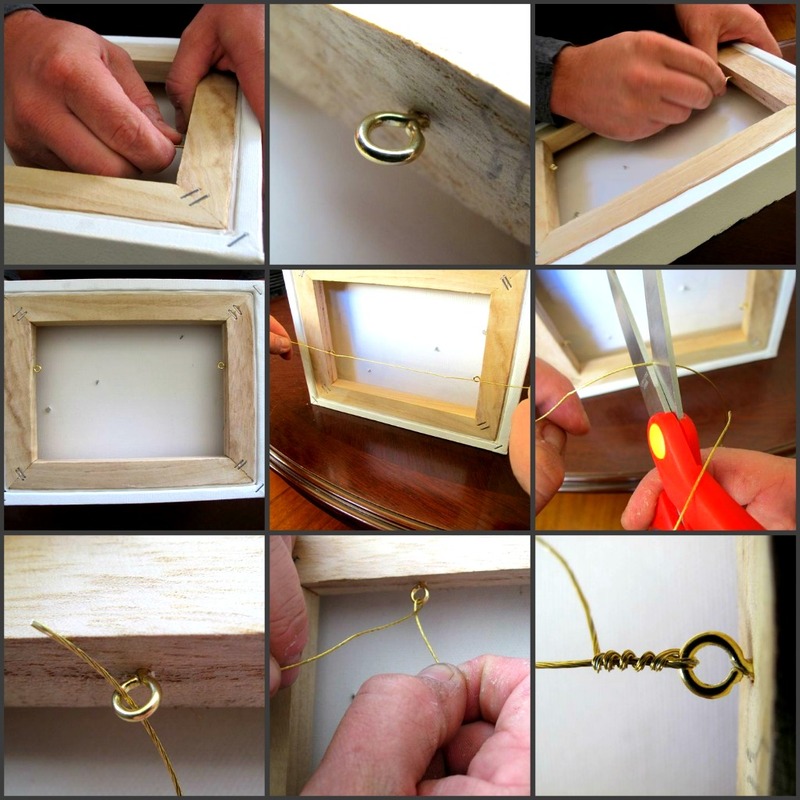 So we thought we'd write a tutorial to show you how you can make one yourself. And here it is! - Gloss (we gloss after the painting stage to give it a nice 'finish' but this is not mandatory and it still looks lovely without gloss). Just a word on this project. There are quite a few steps so I'm not promoting it as quick! 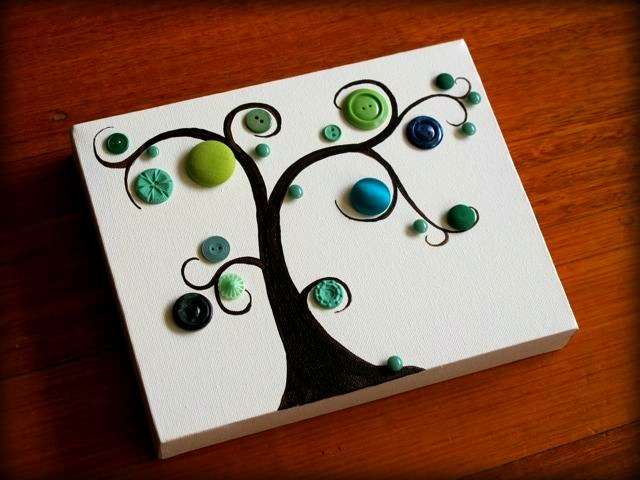 But the result is well worth it if you're determined to have a button tree of your very own. This is definitely a weekend project because there's drying time involved (the paint, the gloss, the glue) so you'll have to do some waiting. You might be able to whip it up in a day but, at the very least, you'll probably need to wait overnight for the glue on the buttons to dry. So if you're going to make it as a gift, or for a particular occasion, give yourself time. 1. 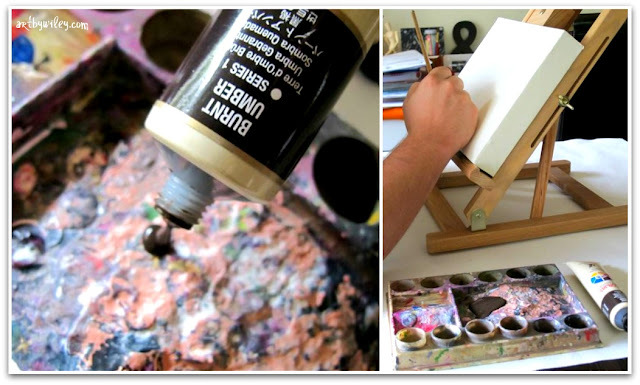 Coat the canvas with background paint. We have sometimes mixed colours to create a particular background shade but remember, if you do, to save a little bit in an air-tight container in case you make a mistake or have a little paint-splash accident while painting the tree. You'll need a perfect mix of that colour to patch up the background. Much easier to use the paint straight out of the tube. 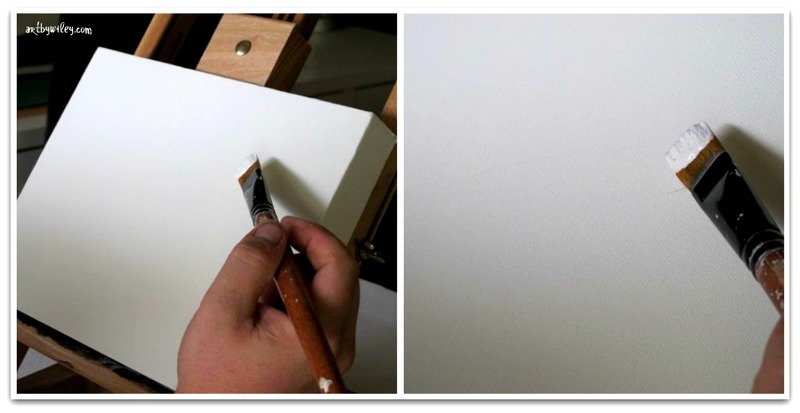 Brush the paint over the canvas in long, fluid strokes, taking care to evenly cover the entire surface and the sides. Wait until it's completely dry then give it another coat. 2. 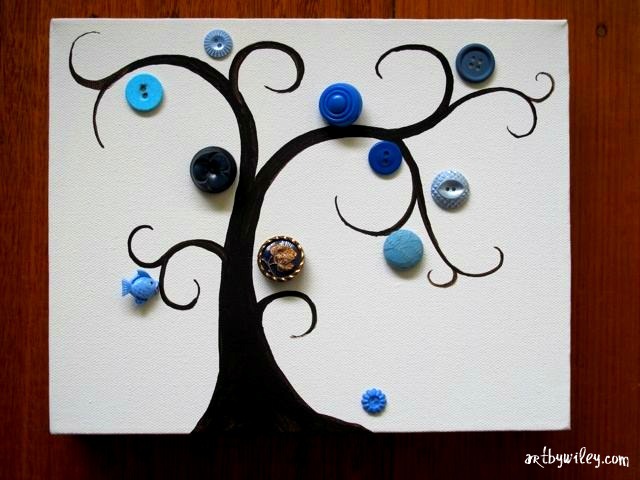 Once your background is dry you can start on the tree. 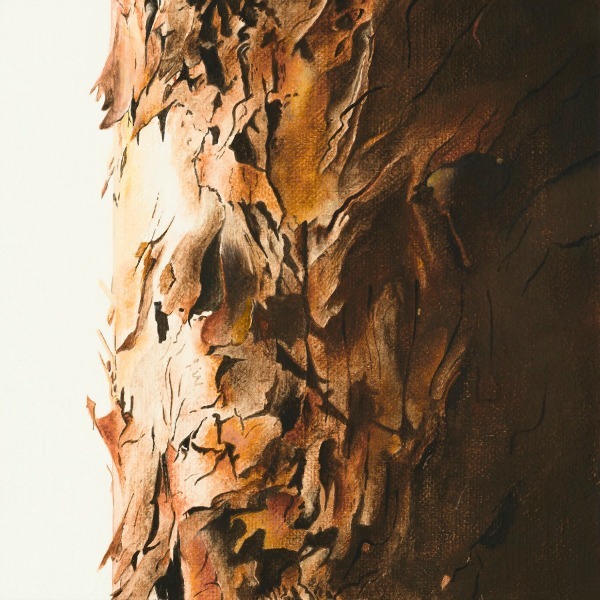 We like 'burnt umber' but you can use any colour you like for your tree. 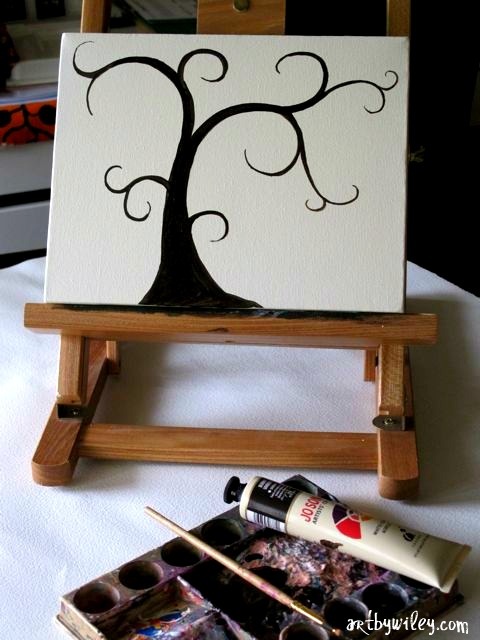 You can draw your tree on the canvas first very lightly in pencil if you feel you need an outline. 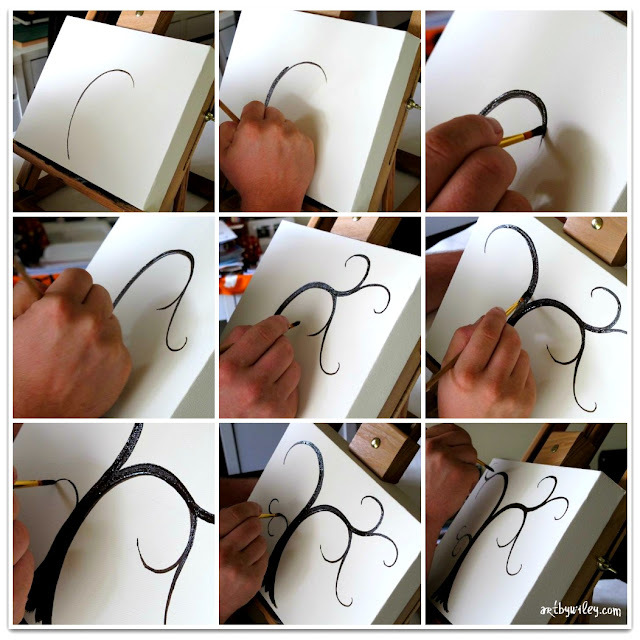 Remember though, that wherever you draw a pencil line you will have to paint over it because pencil is almost impossible to remove from the canvas. Actually, it is impossible. I've tried. We usually paint the tree straight onto the canvas but you could do some practice-trees on paper first to get the shape you like. 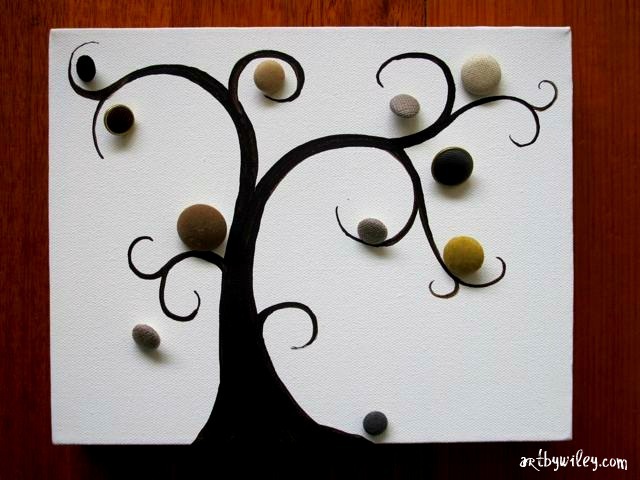 This 'curly' tree that Kim's painting below is what I think of as our 'classic' curly button tree but there are many different ways to paint the tree as you can see in this collage. Don't worry if it's not looking quite right at first because you can always 'fix' it by making the lines thicker or adding more curls to create better balance. Something to remember when drawing trees is that the trunk is thickest at the bottom and then narrows as it goes up. Branches are always thickest as they come off the trunk, then become thinner towards their tips. Let your tree dry completely before you go to the next stage (the most fun in my opinion!). This is where you use a single-colour, but a range of different styles of button. This creates a nice colour connection but the different kinds of buttons create contrast and interest. Have a close look - there are some standard buttons there but some really kooky ones too. Awesome. 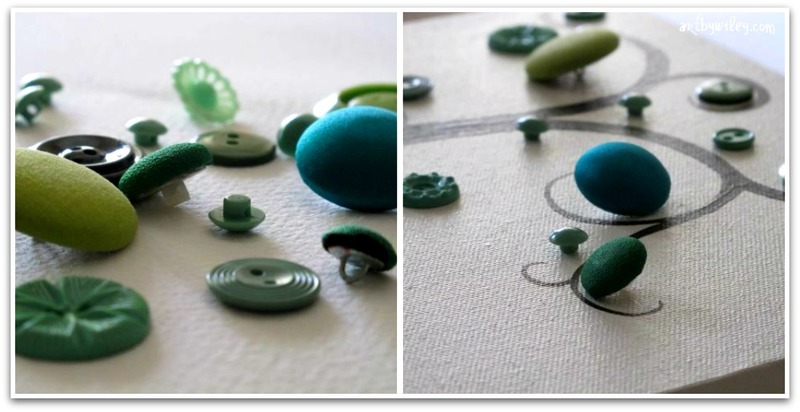 If you want to colour-match for decor, or you only have one little bag of buttons lying around (I'm not sure how this would happen, but you never know!) this is an attractive and nice, neat way to approach it. 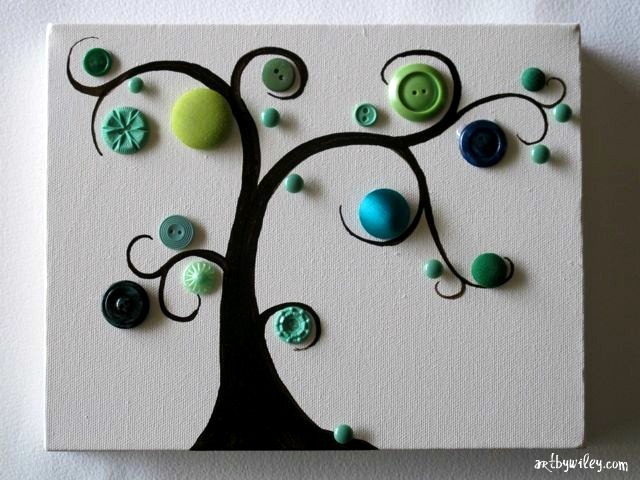 Oh, I am partial to the vintage button tree! 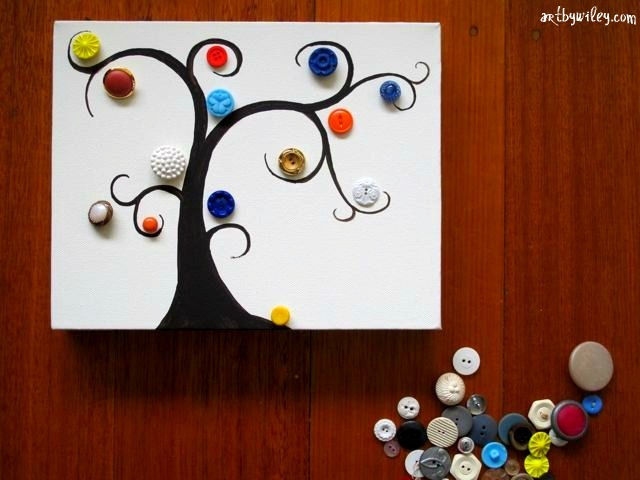 Gather up all those cool, funky buttons floating around your button tin and pop them on your tree. This creates a colourful, fun, button time-warp! Okay, this might be my favourite idea. It doesn't create the most uniform-looking tree but it's definitely the most meaningful one. 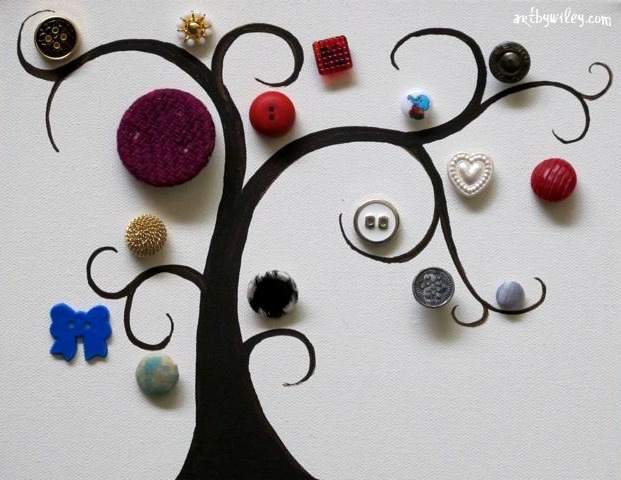 In a play on the 'family tree' concept, you could ask around and get a button from each family member that comes from a significant or special item of clothing (or even a special button they've got in their button stash if they don't want to wrench a button from their precious garment!). 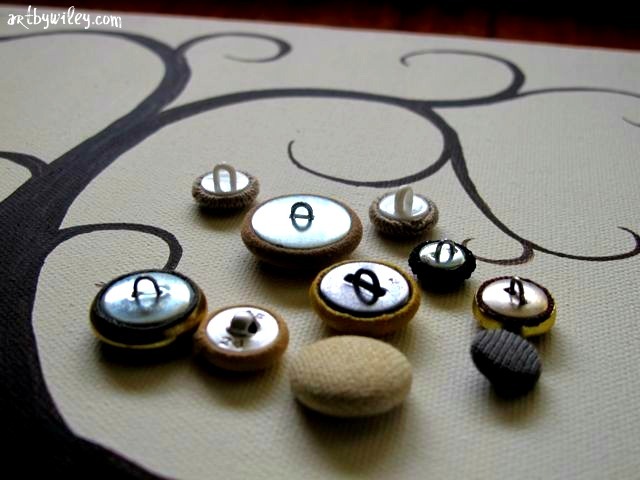 You could also use special buttons from kids' clothes that they've outgrown. This would create a precious memento. A great gift idea too for a special birthday. This creates a problem later when you're gluing. But don't despair. You can still use these buttons. We'll show you how to get around it. Okay, so after all the playing around with colours, shapes, sizes and styles, we've settled on the classic green (to symbolise leaves) but in a range of different types. Phew! 4. Glossing. This is absolutely optional! You might prefer a matte finish, or don't want to be bothered with the gloss. That's okay! It really won't alter your end result a great deal. In fact, you might not want to gloss just in case. We've had some bad glossing experiences where the gloss made the paint run and ruined the artwork. 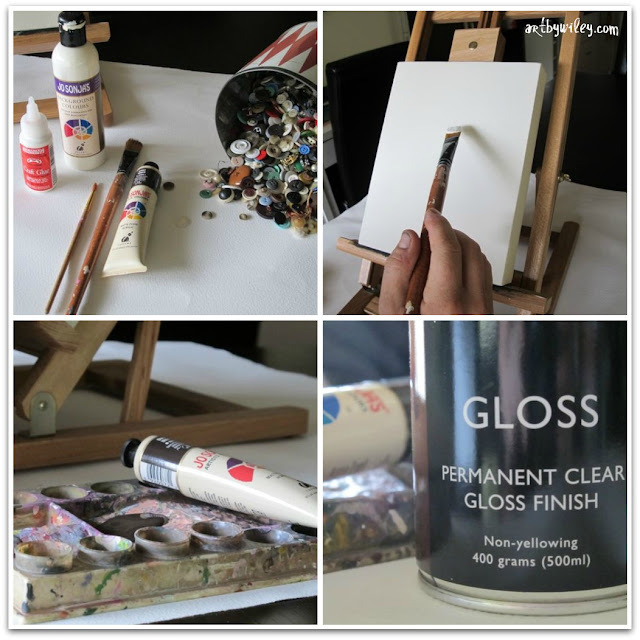 I don't want to scare you off glossing! I'm just saying. This has happened. I don't know why. Maybe it was the brand of paint we were trialling? Maybe we didn't shake the gloss spray can enough. Who knows! But if you do gloss, do it outside or in a ventilated room and make sure kids aren't around. It's stinky! Follow the instructions on the can for spraying. Once it's glossed it doesn't take very long to dry. If you're happy with the coverage, leave it. If you think it needs to be evened out or you want it even glossier, give it another spray. 5. Once the gloss has dried (or if you didn't gloss, once you've decided on the placement of your buttons) it's time to glue! We can't really recommend a brand of craft glue because, to be honest, we've never really found the perfect one. 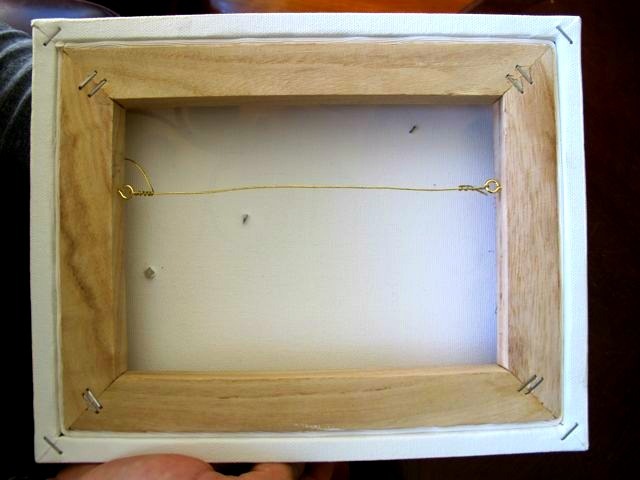 Glues that are stringy are harder to work with but not impossible. This one we're using here is a stringy one. Don't use a fast drying glue (like super glue) because you want to be able to wiggle the button around if you've placed it wrongly. You only need a very little bit of glue on the button because you don't want the glue squelching up around the button and through the holes. 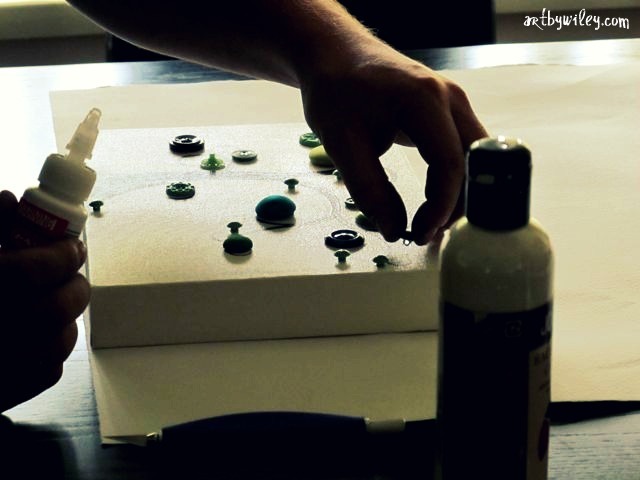 However, if this does happen, don't worry, the glue will dry clear and you'll barely see it. 7. Once you've finished gluing you will need to wait until the glue has set. I can't tell you exactly how long this will take but we would always wait a minimum of 24 hours just to be sure. 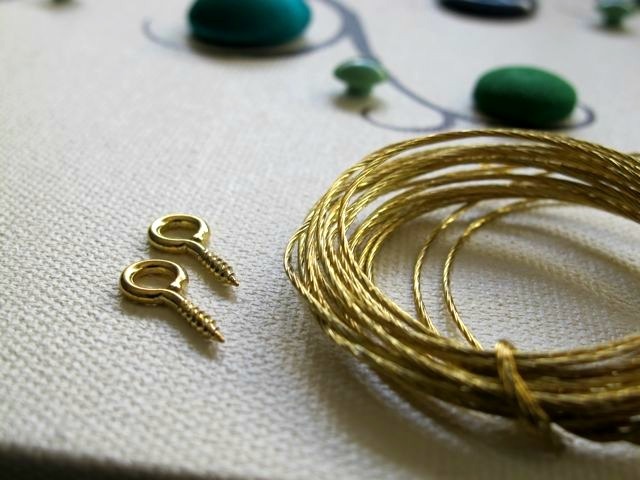 The very last thing you need to do if you intend to hang the canvas on a wall is to attach the hooks and wire to the back. 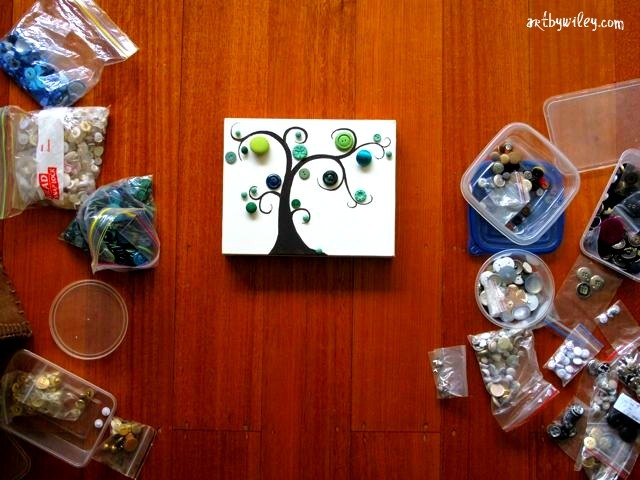 You can get these from craft supply stores or even the craft section of your local hardware store. 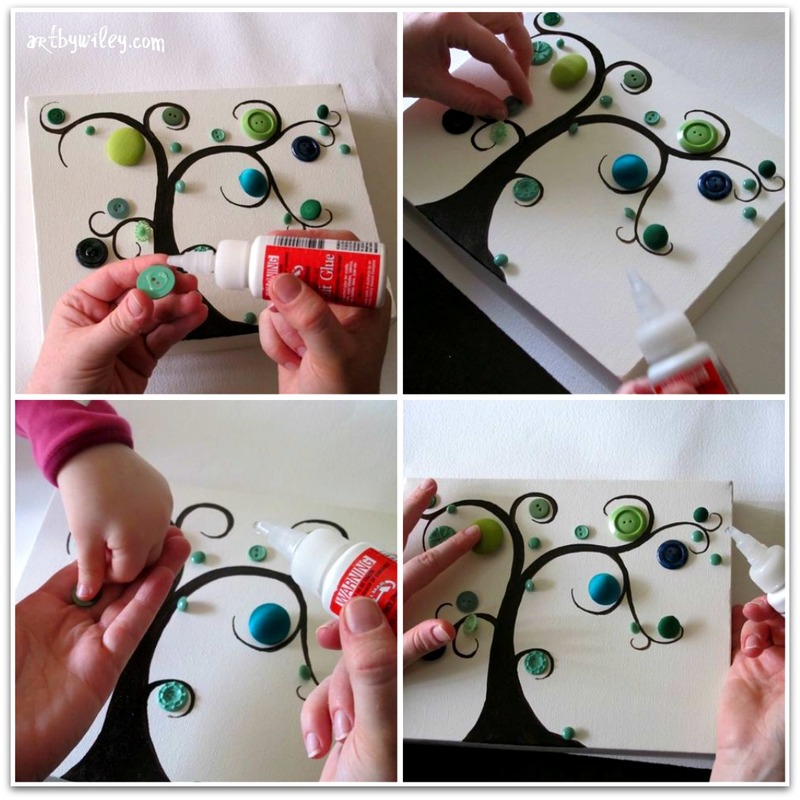 Before you do this, wait until the glue has dried and make sure your hands are absolutely clean as you don't want grubby fingerprints on your white background. Come to think of it, you could probably do this step first! That would make much more sense. However, we always leave it til last! Push the first hook into one of the sides about a quarter of the way down from the top. Once you've made a dent, twist it in. You might need to measure across to the opposite side to get the other one in line. Kim does it by sight. He is very clever like that :) Once you've got them both in, measure the wire across with a bit extra on either side for tying to the hooks. Cut off what you need. Thread one end through a hook and twist the wire around to attach it. Hold the wire almost-taut across (you only need to leave a tiny bit of slack as once it's hanging from a hook it will give a little anyway) and attach the other end to the other hook in the same way. Your canvas is ready to hang! And that's it! You've done it! 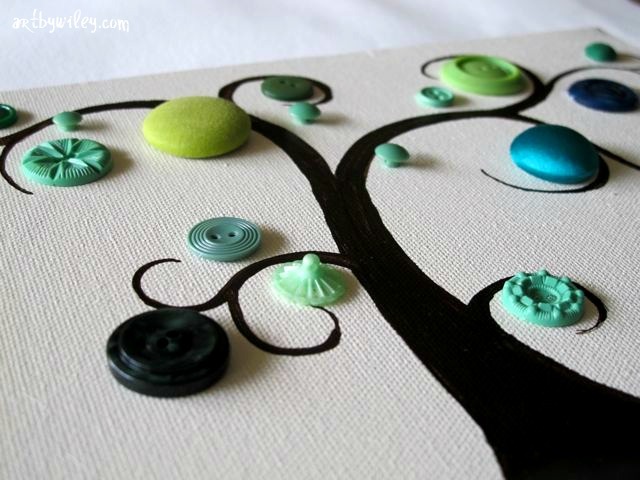 You've created your very own curly button tree. Well done you! 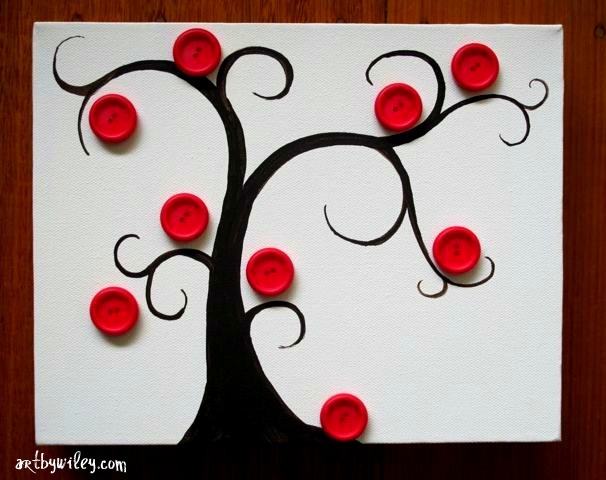 If you do make a curly button tree, please share it! Email me a photo at artbywiley[at]rocketmail[dot]com, or send me the link to the place you've posted the image (and it would be lovely of you to credit this tutorial by linking back).